Brush Cherry ( Syzygium australe, MYRTACEAE ). The silk cocoon is formed inside a rolled piece of leaf, and attached to stick out at right angles to a branch. 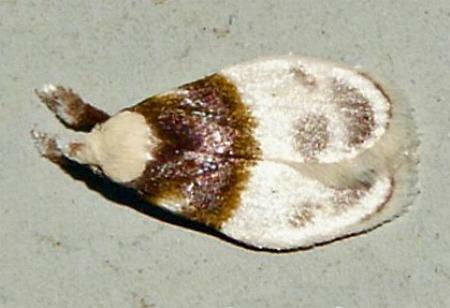 The forewings of the adult moth are white with shadowy patches, and each has a dark brown area at the base. 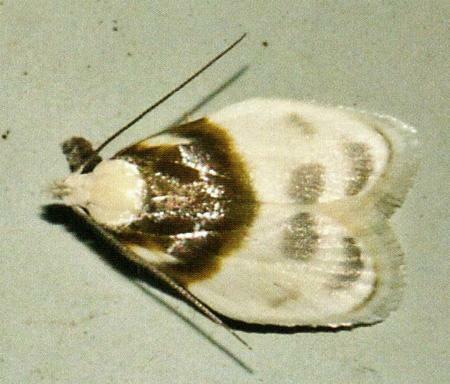 The hindwings are plain off-white. The thorax and head are white. The wingspan is about 2 cms. Melbourne University Press, 1990, pls. 4.24, 23.15, pp. 223, 487. CSIRO Publishing, Melbourne 1994, pp. 24, 29, 148, 217, 221-224. Volume 18 (1894), p. 96. LeapFrogOz, Kuranda, 2015, p. 181.